MONTGOMERY, Alabama, March 24, 2011 (ENS) – Three Alabama river conservation groups have filed a motion to intervene in a permit appeal filed by a business organization against the Alabama Department of Environmental Management, ADEM, to help defend the agency’s stormwater program for small cities. Stormwater runoff is acknowledged to be one of the most serious causes of water pollution in Alabama. Represented by the Southern Environmental Law Center, the intervenors say the lawsuit by the Business Alliance for Responsible Development, BARD, is a delaying tactic aimed at keeping local and state stormwater controls weak and ineffective. 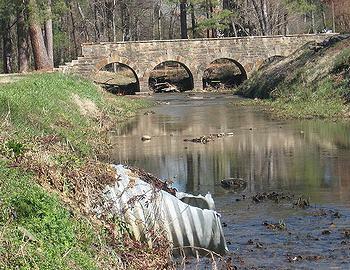 The Alabama Rivers Alliance, Black Warrior Riverkeeper and the Cahaba River Society take the position that without adequate programs to control polluted runoff from development and urban uses, downstream communities and businesses will continue to shoulder the high costs to clean drinking water and repair flood damages. “Every delay in halting polluted runoff means more degradation of our water and higher long-term clean-up costs for the public,” said Gil Rogers, head of the Clean Water Program for the Southern Environmental Law Center, which filed the motion earlier this week with the Alabama Environmental Management Commission. The proposed permit will govern the local stormwater programs of some 60 smaller cities and counties for the next five to seven years. Just as important, Rogers said, ADEM has indicated this permit will be the basis for other stormwater permits that will be written for larger cities and counties, as well as for the Alabama Department of Transportation. Under the federal Clean Water Act, ADEM is required to set up a permitting program for small cities to control their polluted stormwater runoff. In August 2010, the U.S. Environmental Protection Agency rejected state agency’s first version of the program because it did not meet basic requirements of the law. It was the first time the EPA had ever taken such a step with any state. ADEM then made some improvements and issued a final permit on February 1. “Many responsible developers in Alabama are already achieving the standards called for in ADEM’s permit,” said Beth Stewart, executive director of the Cahaba River Society. BARD accuses the Cahaba River Society of supporting low-growth or no-growth policies that hinder economic development in the region. The intervor groups say BARD’s challenge of the state’s stormwater permit is one more salvo in its continued resistance to improving development practices that protect water quality. The storm water authority rescinded the 2005 fee increase after BARD filed a lawsuit, in which the business group prevailed. But the river conservation groups say BARD’s “misguided advice” that local governments are doing too much to stop stormwater pollution has already made some cities and counties vulnerable to EPA audits and enforcement oversight. In 2009 and 2010 the EPA found that the stormwater programs of cities and counties in the Birmingham-Hoover metropolitan area did not meet basic requirements of the Clean Water Act.